With the Grace of Allah, blessings of Sarkar Hazrat Qibla Hasni Mia Sahab (Q.S.A.) 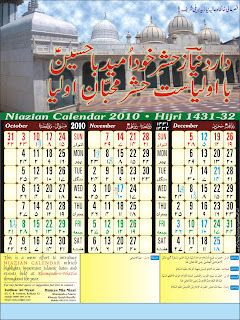 and efforts of brother Zulfikar Ali Niyazi, for the first time "The Niazian Calender 2010 (Hijri 1431-32)" has been launched. 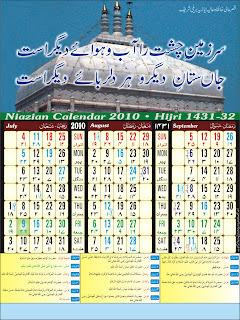 With both the Gregorian & Hijri dates, it has information of Islamic Festivals,dates associated with various Islamic Personalities, Urs dates & especially dates related to Buzurgs of Silsila-e-Niyazia. 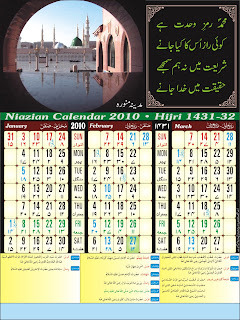 It has taken a lot of hard work & time of Zulfikar bhai in completion of this beautiful calender.He and the people who helped him deserve all the complements. 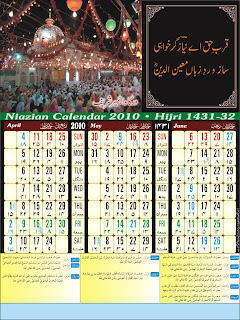 The jpg file of the calenders can be copied from here.